The Masonic Hall has played significant roles in the building of community in Issaquah. First, serving as a fraternal lodge, the hall was the site of socializing and the development of community ties. A newspaper photo and caption in the Issaquah Historic Society files shows that this property had a false front until it was removed in 1965. A renovation also replaced original wood double hung windows with aluminum windows. King County Assessor records show ownership in 1919 and 1923 by James E. Terry, Master Mystic Lodge No.108. A 1940 Assessor photo of the building shows M.B. Castleberry Hay Feed Straw business at this site. 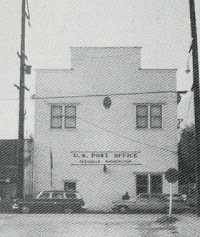 The post office was located here for 22 years from 1940 until 1962. At other times the lower story has housed other businesses, such as theater, a plumbing shop, a TV repair shop, and a food market. 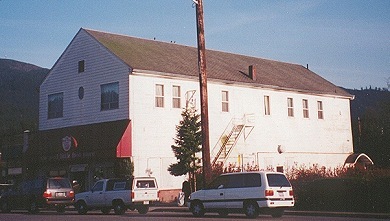 As of 2011, the upper story of the building continues to be used for Masonic Lodge purposes, and the lower story is used by the Issaquah Brewhouse. Masonic Hall, circa 1940s. At this time, the building was also in use as the Post Office. This large two story building is sited close to the main intersection of the current Front Street and Sunset Way. Originally a western false front faced the street; without it the building currently has a medium pitched 36′ wide front gable building that runs 90′ deep into the lot. Original pairs of double hung 1-over-1 windows have been unsympathetically replaced with aluminum windows. Flat horizontal wood siding clads the front façade; original rustic drop wood siding clads the side. The commercial storefront has been altered with new aluminum windows and brick veneer.